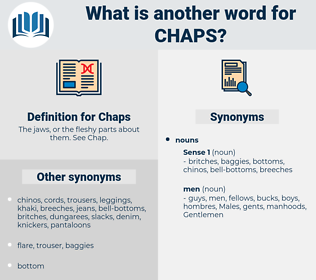 What is another word for Chaps? The jaws, or the fleshy parts about them. See Chap. chapter, chapters, penny, Sheila, seasons, -guys, boys, BROS, Leslie, guys, fellas, CH. 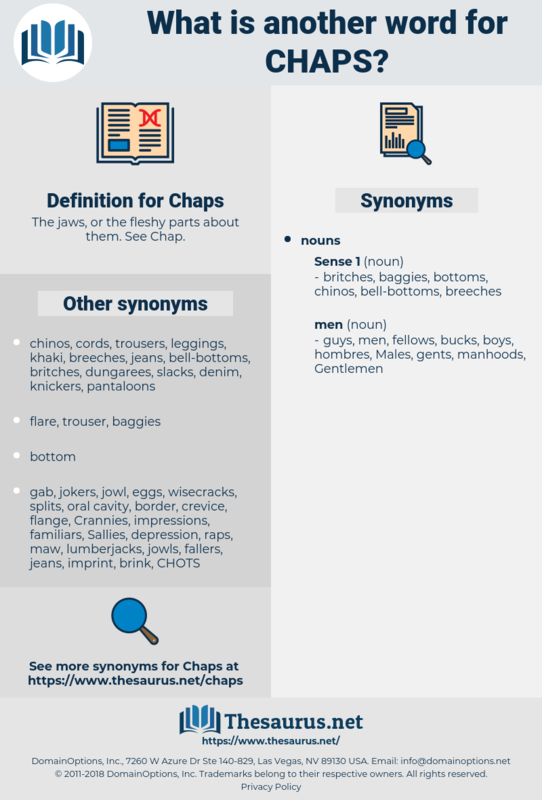 champs, chums, PACS, companions, CHS, brothers, capes, fascicles, classmates, headlands, playmates, Friendships, quarters, pals, cats, classrooms, dossiers, dudes, people, feilas, mates, 'arts, Amigos, cowboys, boyfriends, Shelves, buddies, bushes, Cronies, men, kiddies, strands, Classes, GARS, types, gens, 12th, studs, arts, niggas, kinds, sorts, genres, twelve, seasons, folks, boys, BROS, guys, fellas, Friends.
" Oh," he almost passionately sighed, " if I were only, pen in hand, one of you chaps!" I'm beginning to envy you city chaps now.